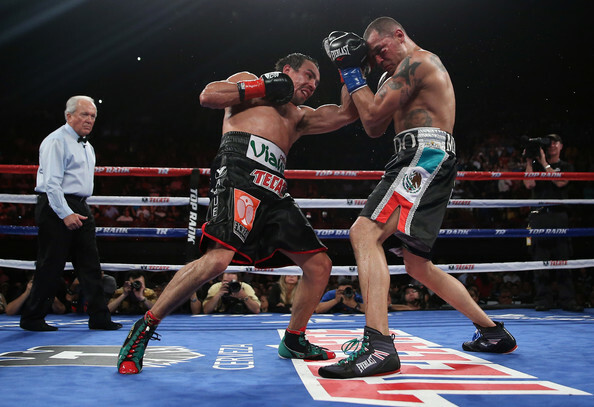 In order to get a shot at a Welterweight title, Juan Manuel Marquez needed to beat Mike Alvarado in an eliminator. He had no problem doing that despite getting knocked down late in the bout, coming away with a comfortable unanimous decision (119-109, 117-109, 117-109) that gave him the unimportant WBO international Welterweight belt but more importantly put him closer for a fifth fight with Manny Pacquiao. From the first moment until the final bell, Marquez was in complete control. The 40 year old, looking to be the first Mexican fighter to win major title belts in five different weight divisions, kept hitting Alvarado’s right side, creating a huge swelling around his eye with clean accurate jabs. Through the first six rounds, it looked like Alvarado was unable or unwilling to even put up a fight. Things changed in the sixth round as the 33 year old, coming off two losses in his last three fights including one to Ruslan Provodnikov back in October 2013, started connecting with some of his shots. However, he did get knocked down and managed to beat the count in the eighth. He did have a nice exchange of blows with Marquez to end the sixth, but Marquez came out with his hand on top from that one as well. In the ninth came a moment that seemed to stun the massively pro Marquez crowd inside the Forum, which hasn’t hosted a boxing night since 2001. 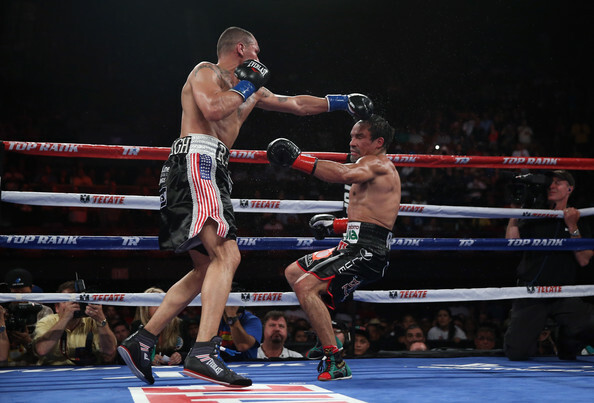 Alvarado landed a clean right which probably stunned Marquez more than anything, because as the arena fell silent with shock, Marquez got up and went back to business in a fight he had every business walking away as the winner of. Alvarado’s left eye looked very bad by the end of the 11th round as well, but he still managed to land another big right hand that made Marquez’ legs buckle. Alvarado hardly did anything worth mentioning for most of the fight, but he had two moments that almost won him it out of nothing. Marquez managed to stay on his feet, and come through with the win, improving to 56-7-1 throughout his hall of fame career. The compubox numbers showed there wasn’t even a question. Marquez, making $1.4 million from this fight, landed 278 of 627 punches (44%) and landed more punches than Alvarado in 11 of the 12 rounds. His opponents, making $650,000 from the evening of boxing landed 178 of 510 blows (35%). It was the second consecutive loss for Alvarado and the third of his career, all coming within the last two years. He did get to avenge his first loss to Brandon Rios by beating him four months later. So now it’s off to see if Pacquiao is his next opponents. The two have been in four fights. Pacquiao won two of them and another was declared a draw, but the one everyone remembers happened on December 2012, when Marquez knocked Pacquiao out with a huge right cross that knocked the Filipino legend out in the sixth round. In terms of money and exposure, that’s the one Marquez wants, and can’t get anything better than. Whether or not it will happen remains to be seen.